No matter who you are or where you live, your front lawn presents your first impression to the world. You take great care to make your home welcoming and comfortable, but guests see your lawn well before they reach your living room. Proper lawn maintenance doesn’t just make your lawn look nice. It also provides a great space for you to spend your time. If you have young children, then quality lawn maintenance is a must. Kids need to spend time outdoors in the sunshine, and a beautiful, well-maintained lawn will get them outdoors. A great lawn entices you to share in the fun with summer barbecues or a game of catch with the dog. What does lawn maintenance at Fallas Landscape entail? At Fallas Landscape, we do it all. If you need regular mowing, edging, and weed eating, we can do that for you. The timely application of fertilizers and pre-emergent herbicides is a turnkey service that we can provide. Seasonal mulching, regular weeding and trimming shrubs keep your property looking its best. If you want to keep your perennial flowerbeds or vine laden trellises looking gorgeous, we do that as well. Each lawn has a unique signature, and the Fallas Landscape lawn maintenance team understands this. Some homeowners like to keep their lawns green during the winter by overseeding with ryegrass. Others select a Tiff putting green feature in the backyard. The same team that maintains your gardens and lawns also implement our landscape designs and build landscaping architecture, so you know they have professional experience with all aspects of lawn care. No matter what you need, we can work with you to provide the same level of lawn care you would do yourself if you had the time. How often do you need lawn maintenance? All lawns need different things, but regular lawn maintenance has many benefits for all yards. A well-maintained lawn looks beautiful, entices one outdoors in nice weather, and stays healthier. Bermuda and St. Augustine grass lawns need cutting on a regular basis so that each plant gets a balanced share of resources. When grass gets long, it no longer keeps a uniform length. This allows some plants to absorb more sunlight and more water, causing these plants to grow more than others. The same thing can happen in your garden. Without proper care, certain flowers or plants will start to encroach on other plants. The actual timeframe for regular maintenance varies depending on the specific plants and the weather, but we generally say you should get lawn care once a week during the Spring, Summer, and Fall. Your monthly billing amount is billed at the beginning of each month and spread equally over 12 payments. This helps to level out the seasonal highs (April – Sept) and lows (Oct – Feb). This is a minimum 12 month commitment and requires a 45 day notice for cancellation. At Fallas Landscape, we love all things lawn. We construct outdoor living spaces, stonework patios, and other landscaping architecture. We also provide lawn maintenance long after we build those structures. 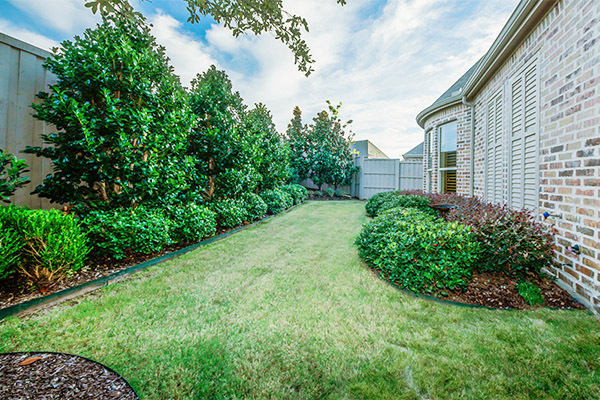 Because we have a sincere passion for landscaping, we make each and every lawn a priority. None of us would own shabby lawns, and we take great care to make your lawn look as amazing as we would our own. If you want to put your lawn care into the hands of seasoned professionals who care, you should contact Fallas Landscape today.